Situated in the Hertfordshire countryside, just four miles from Hatfield and six from St Albans, is one of Britain’s finest Jacobean homes - North Mymms Park. And on the 17th and 18th April 2018, Sworders Fine Art Auctioneers will sell its primary contents. The current house at North Mymms was built for the Coningsby family - High Sheriffs of Hertfordshire. Remodelled and resold many times across four centuries, in its many guises it has been a sanctuary for fine art and antiques. The exquisite tapestries have long been revered - a reminder of an era when these monumental weavings were the ultimate expression of status, power, taste, and wealth. Most were collected by the Anglo-American banker Walter Hayes Burns and his wife Mary, who purchased the estate in the 1893 to accommodate their growing art collection. Nineteen of these larger-than-life textiles form the centrepiece of Sworders’ sale - including two part sets that came to North Mymms via the American financier and collector John Pierpont Morgan. The Great South Hall Then and Now - On the left, the great South Hall as it looked in the late 19th century when owned by the Anglo-American banker Walter Hayes Burns (1838-97). The monumental stone chimneypiece was among the alterations made at North Mymms by the Victorian architect Sir Ernest George. On the right, the South Hall today with the Burns family tapestries still in situ. The house has many reminders of its 17th century roots - vernacular furniture, leather blackjack ale jugs, and Tudor and Stuart portraiture. But the collection spans five centuries of artistic endeavour. 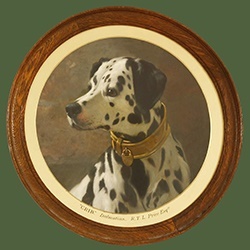 More than 100 paintings in the sale range in period and style from 16th century panel paintings to Victorian marines while fine examples of English and Continental furniture are complemented by Georgian and later table silver. Bringing the collection up to date is the North Mymms collection of post-war silver goblets, commissioned from British silversmiths into the present day. In total around 650 lots will be sold in April. This ranks among the finest house sales Sworders have conducted in 30 years and will be one of the most important auction events of the spring.